Specifications BlackBerry Z10 will be powered by a dual core 1.5GHz processor , 2GB of RAM , 16GB of internal storage , 4.2 -inch LCD screen 1280 × 768 @ 356ppi , 8MP main camera and 2MP front camera , 1.800mAh battery , microSD slot , Bluetooth , NFC , LTE ,Wi - Fi and using the latest BlackBerry OS 10 . For the present BlackBerry software built hub that will integrate all email notifications and social media , Story Maker memungkintan user to create and edit videos , applications compass , voice control, a map, as well as the BlackBerry App World which has 70,000 applications for download. 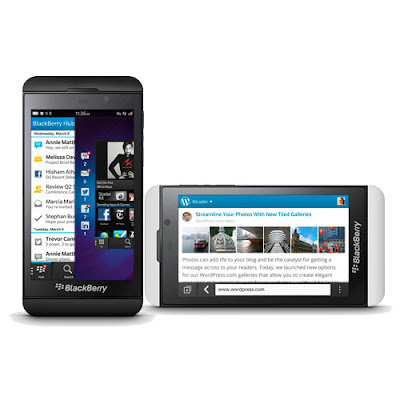 0 Respones to "BlackBerry Z10 was released with its 1.5GHz dual -core , LTE and 10 BB"